This article is about the Hindu moon deity. For other uses, see Chandra (disambiguation). Chandra (Sanskrit: चन्द्र, IAST: Candra, lit. "shining" or "moon")[a] is a lunar deity and is also one of the nine planets (Navagraha) in Hinduism. Chandra is synonymous to as Soma. Other names include Indu (bright drop), Atrisuta (son of Atri), Sachin (marked by hare), Tārādhipa (lord of stars) and Nishakara (the night maker). Chandra is described as young and beautiful, two-armed and carrying a club and a lotus. In Hindu mythology, Chandra is the father of Budha (planet Mercury). Chandra, who is also known as Soma and Indu, is the basis of Somvaar, which is Hindi, and Induvaasaram, which is Sanskrit, for Monday in the Hindu calendar. In Hindu mythology, there are multiple legends surrounding Chandra. In one, Chandra meets Tara, the wife of Brihaspati (planet Jupiter) and they both fall in love. From their union, Tara became pregnant giving birth to Budha (planet mercury). Brihaspati becomes upset and declares a war. The Devas intervene and Tara returns to Brihaspati. Budha's son was Pururavas who established the Chandravanshi Dynasty. After Tara returned to her husband Brihaspati, Chandra had an emotional breakdown because he couldn't satisfy his feelings by having infinite children's with Tara and so He (Mind) was overcomed by lust (Emotions).He pursued Daksha's 27 daughters to get married to curb his ever-growing desires for sexual union. According to Chandra, He favors only Rohini among all of His 27 wives. The 26 other wives become upset (after knowing that Chandra spends more time with Rohini alone) and decided to complain to Daksha and he places a curse on Chandra for His terrible sins. The curse is only overcome after Chandra devotes himself to Shiva, who partially releases him from the curse. According to another legend, Ganesha was returning home on his mount Krauncha (a shrew) late on a full moon night after a mighty feast given by Kubera. On the journey back, A snake crossed their path and frightened by it, his mount ran away dislodging Ganesha in the process. An overstuffed Ganesha fell to the ground on his stomach, vomiting out all the Modak's he had eaten. On observing this, Chandra laughed at Ganesha. Ganesha lost his temper and broke off one of his tusks and flung it straight at the moon hurting him and cursed him so that he would never be whole again. Therefore, It is forbidden to behold Chandra on Ganesh Chaturthi. This legend accounts for the Moon's waxing and waning including a big crater on the moon, a dark spot, visible even from earth. Chandra literally means the "Moon" in Sanskrit, Hindi and other Indian languages. The word "Chandra" is also a common Indian name and surname. Both male and female name variations exists in many South East Asian languages that originate from Sanskrit. Indu, one of the other names for Chandra, is also the name of the first chakra of Melakarta ragas in Carnatic music. The names of chakras are based on the numbers associated with each name. In this case, there is one, the Moon and hence the first chakra is Indu. Chandra plays an important role in one of the first novel-length mystery stories in English, The Moonstone. 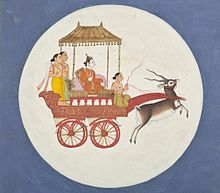 The Sanskrit word Chandrayāna (Sanskrit: चन्द्रयान, Moon Vehicle) is used to refer to India's lunar orbiters. Chandra is the first name of a popular character, Chandra Nalaar, in the collectible card game, Magic: The Gathering. ^ In other languages: Kannada ಚಂದ್ರ, Telugu చంద్రుడు, Tamil சந்திரன். ^ Roshen Dalal (2010). Hinduism: An Alphabetical Guide. Penguin Books India. p. 394. ISBN 978-0-14-341421-6. ^ a b Roshen Dalal (2010). Hinduism: An Alphabetical Guide. Penguin Books India. pp. 393–394. ISBN 978-0-14-341421-6. ^ Usha, K R. "Why Ganesha has a Broken Tusk or Why the Moon has a Crater". The University of Iowa. Retrieved 30 June 2017. ^ "CHANDRA NALAAR". MAGIC: THE GATHERING. Retrieved 15 October 2018.